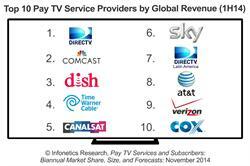 CAMPBELL, CA--(Marketwired - November 19, 2014) - Market research firm Infonetics Research released excerpts from its latest Pay TV Services and Subscribers report, which forecasts and analyzes the cable TV, satellite TV, telco internet protocol television (IPTV), and over-the-top (OTT) services markets. "Subscription-based over-the-top (OTT) providers like Netflix, Hulu Plus, and Amazon have seen phenomenal growth over the last couple of years. With a combination of wide availability across end devices, user-friendly interfaces, and access to vast content libraries, these providers continue to challenge traditional pay-TV providers and are in the early stages of siphoning off revenue," notes Jeff Heynen, principal analyst for broadband access and pay TV at Infonetics Research. "But beyond this approach," continues Heynen, "OTT providers are now expanding their relationships with traditional pay-TV providers to get their apps and services integrated directly onto consumer set-top boxes (STBs), gaining access to a much larger pool of current pay-TV subscribers." 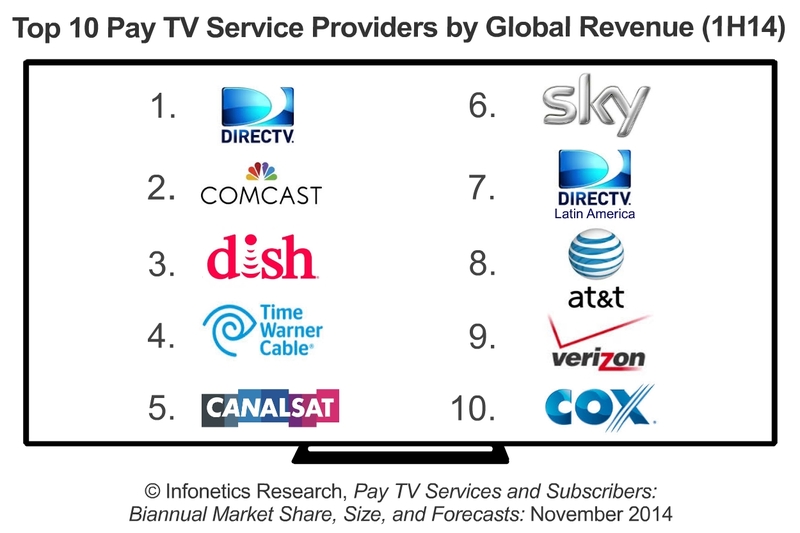 See Infonetics' companion Pay TV Subscriber Database and Video Equipment Tracker, published November 4, 2014, for additional data and demographics on the digital and analog cable pay-TV, satellite pay-TV, and telco IPTV subscribers of more than 140 providers around the world. Combined with the included Video Equipment Tracker by Provider Tracker, this service helps pay-TV equipment vendors focus sales efforts by keeping track of which operators are adding pay-TV subscribers and where, and allows pay-TV operators to keep an eye on the activities of peers. Infonetics' biannual pay-TV services and subscribers report provides worldwide and regional market share, market size, forecasts through 2018, analysis, and trends for telco IPTV, analog and digital cable video, and satellite video service revenue, ARPU, and subscribers and OTT revenue and subscribers. Pay-TV providers tracked: AT&T, Beijing Gehua, BCE (Bell Canada), British Sky Broadcasting, Cablevision, CanalSat, Charter, China Telecom, Comcast, Cox, DirecTV, DISH Network, J:COM, Jiangsu Cable, Kabel Deutschland, Netflix, Orange, Shaw, Sky Italia, Tata Sky, Time Warner Cable, UPC Broadband, Verizon, Virgin Media, and many others. To buy the report, contact Infonetics: www.infonetics.com/contact.asp. Set-top box market hits $4.8 billion 2Q14; market seeing "mixed signals"
Download Infonetics' 2014 market research brochure, publication calendar, events brochure, report highlights, tables of contents, and more at www.infonetics.com/login. Visit www.infonetics.com/infonetics-events to register for upcoming webinars, view recent webinars on-demand, or learn about sponsoring a webinar. Infonetics Research is hiring analysts. See our job openings here. Infonetics Research (www.infonetics.com) is an international market research and consulting firm serving the communications industry since 1990. A leader in defining and tracking emerging and established technologies in all world regions, Infonetics helps clients plan, strategize, and compete effectively. View Infonetics' About Us slides here.